Social Media Ethics: May the words of my internet comments and the meditation of my text messages be acceptable to You, Lord. Jesus never wrote a blog post. He never posted his status on Facebook or Instagrammed the baskets of extra food at his latest miracle feast. (That would be cool, huh?) Jesus never got an angry email or got caught up in an emotional text argument. Our faith is rooted in a time long before this sort of disembodied communication was possible for mere mortals. Because our technological reality seems so far removed from the dusty world of 1st century Palestine, it’s easy to let the digital domain remain separate from our life as followers of Jesus. Our problem is not with digital communication. Our problem is that we compartmentalize our lives so easily that we think of digital communication as something different, something that falls outside of our relationship with Christ. Email is just business. Twitter is just for fun. Facebook is just for catching up with friends. Snapchat just for ephemeral messages between friends. We build these little boxes! But these are not separate things! They are all new ways to communicate, just more ways to be in relationships with others and with the world. Everything we already know about being in relationship with others as followers of Jesus still applies. All that’s new is the need to keep in mind the limitations and potential problems of digital communication. Beyond that, it’s just one more way for us to love our neighbor as ourselves. 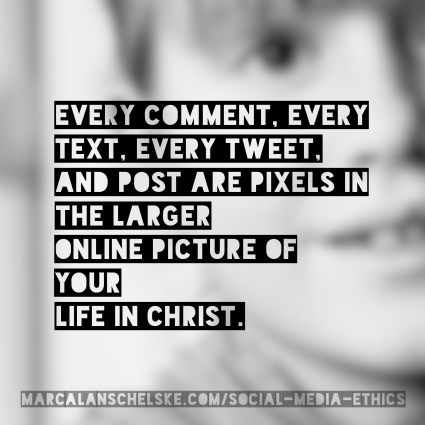 Every comment, every text, every tweet, and post are pixels in the larger online image of our life in Christ. They contribute to the picture of who we are, and how the world sees us, the church, and One we claim to follow. They are new building blocks in our effort to bless and serve the world. 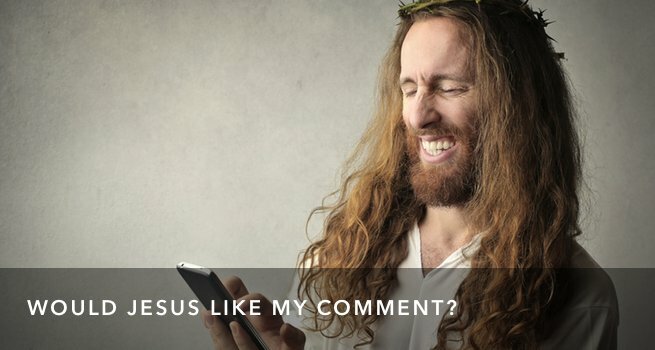 So, how do we communicate online in a way that Jesus might support? As followers of Jesus, thinking about how we relate to others is vital. There are, of course, piles of passages that can give us guidance. Two passages, however, summarize all the others. One found in the words of Jesus, the other in an ancient Old Testament sermon that Jesus truly embodied. Taken together, these passages offer us a clear ethic for how to live in relationship. They also can give us guidance for our lives online and all our digital communication. Love the Lord your God with all your heart, with all your soul, and with all your mind. This is the greatest and most important command. The second is like it: Love your neighbor as yourself. All the Law and the Prophets depend on these two commands. Jesus concisely took the 613 Jewish laws, and all of God’s scriptural guidance, and boiled them down to the heart of the matter. The second passage is Micah, the prophet’s famous injunction. Micah 6:8. Walk humbly. Then you will be truly loving God and others, living in unity with God’s heart. So far we’ve not mentioned our life online or digital communication. But because these things are just new ways to be in relationship with others, they don’t need new or different commands. This sequence provides the filter. It may seem obvious, but let me walk you through it. I’m about to post a blog or a comment on Facebook. I’m about to write a reply email or a quick text. What would happen if, just before I tapped send, I stopped and ran my words through this filter? Is what I’m about to post congruent with loving God with everything I am and have? Is it an expression of loving my neighbor as myself? Would I appreciate being on the receiving end of this communication? Not just the content, but the tone, and the context? Is what I’m about to post just? Not only in the sense of being fair, but also in the sense of being good? Is what I’m about to post merciful? Are both the words and the tone carrying a sense of gentleness, care, and grace? Is what I’m about to post humble? Is it presented with an awareness that I am not the final answer, not the final judge, not even always aware of all the details or nuances of any topic? Do I leave space to be wrong? Perhaps you already carefully consider every word you say online, but I can say for me that running my words through this filter would dramatically change the things I have to say online. Heck… it would change the things I have to say in person. Maybe that’s the point. As I consider this filter, I can immediately see changes that would happen for me. Maybe the same would be true for you? We probably wouldn’t do drive-bys where we jump into conversations that we’re not really a part of, where we don’t fully understand the relational context. We probably wouldn’t make universally condemning statements about complicated issues that we feel strongly about. Perhaps we might assume that if people who feel strongly on the issue and disagree with us might, in fact, have reasons that make sense to them, just like we have reasons that make sense to us. Maybe we’d choose dialogue over memes. We’d step away from demonizing people, or condemn others to hell. We probably wouldn’t exaggerate our life’s positives and underplay our life’s negatives when we post about ourselves online. We probably wouldn’t post passive-aggressive rants about “some people” in our lives because that’s not how we’d like to be treated. We might use our digital communication as a way to encourage and lift up people, rather than contributing to anger, fear, and division. We might let online comments be the doorway to real-life phone calls and coffee visits where we can hear more deeply and understand the circumstances of people’s lives. None of this means we should no longer speak out on important topics, or engage in controversial conversations. This doesn’t mean that we stand for nothing. This doesn’t mean that we stop advocating for the causes and needs that we care about. Instead, this is an invitation to speak, to engage, to advocate, in a way that is built on a foundation of respect and love, something the internet could use more of. Digital communication — social media, texts, email — this is new frontier for us. We’re only just learning how to handle ourselves in these spaces. Be clear: Digital communication is not some separate thing, set apart from our life as followers of Jesus. It’s just one more aspect of our lives that we’re are invited to bring under Jesus’ authority. It’s one more place for us to love God with all we are and have, to love our neighbor as ourselves, to do justice, to love mercy and walk humbly with our God. In your journal consider the last month of digital words you’ve spoken. Think of emails, texts and social media posts. If these words were all that a stranger knew about you, what kind of person would they assume you to be? Does this assessment align with who you want to be? With who you believe God is calling you to be? What single change in your online communication would make the most difference? There are 16 comments Mind the Comment Policy.